I really thought I’d nailed this whole pest control thing. I solved the mouse, nay mice, in the car problem with a thorough cleaning and scented dryer sheets. About a week ago, I discovered mouse turds on the kitchen counter. No problem at all. We’ve been here before. I set a trap. The next morning, the peanut butter had been licked from the trap, with a little pile of mouse poop next to it, mocking me. The trap had not snapped. The next morning, the trap was licked clean. I set a second trap and tried to position the two strategically so the mouse couldn’t get to one without snapping the other. Upon the advice of a coworker, I replaced the almond butter with cheese. 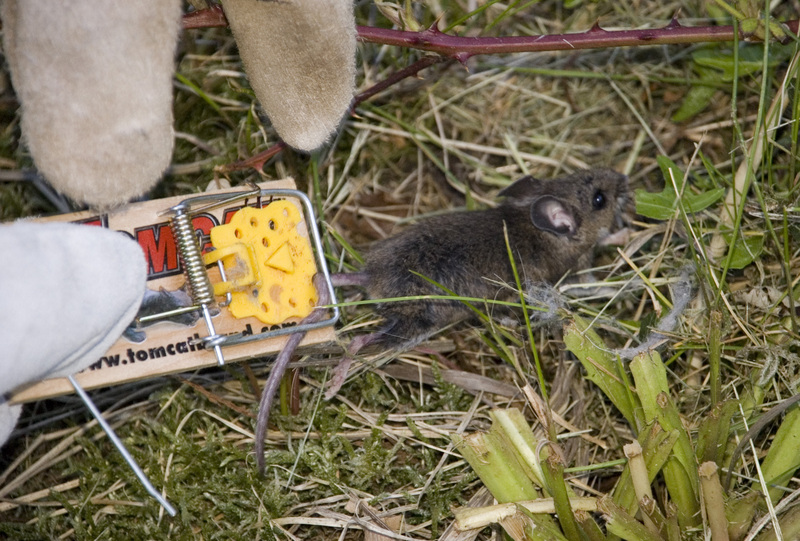 For two more nights, the mouse nibbled the bait from the trap and left taunting little turds beside it. Last weekend, we awoke in the night for whatever reason, and I saw that cheese had been nibbled from only one of the traps. I moved an electronic trap, which so far has never caught a mouse, next to the two traps in a formation I was sure would lure the mouse to his snappy demise. A short while later, we heard a great clang. “Go get it, go get,” I told Rob. “Go look at it, go look at it,” I told him. Evidently, the mouse had been lying on his back, looking dead, when it and the trap suddenly started scooting back behind the oven. I wondered later if the mouse had a buddy who was trying to save him. When I arrived, I saw the trap turned over, with a little tail sticking out. I checked back later and I couldn’t see the tail. I reached for the trap which had a little foot in it, but when I pulled, the little leg stretched, and then the mouse was gone behind the oven. A few more nights of cat and mouse went by and last night, Isis woke me up acting very strangely. She wasn’t whining, but I could tell she was really freaked out about something. I’m highly attuned to this dog; I knew a trap had snapped. Indeed, one of the traps was upside-down on the stove top. The other was nowhere to be found. Rob pulled out the oven this morning and didn’t see anything. I resigned myself to get a glue trap. 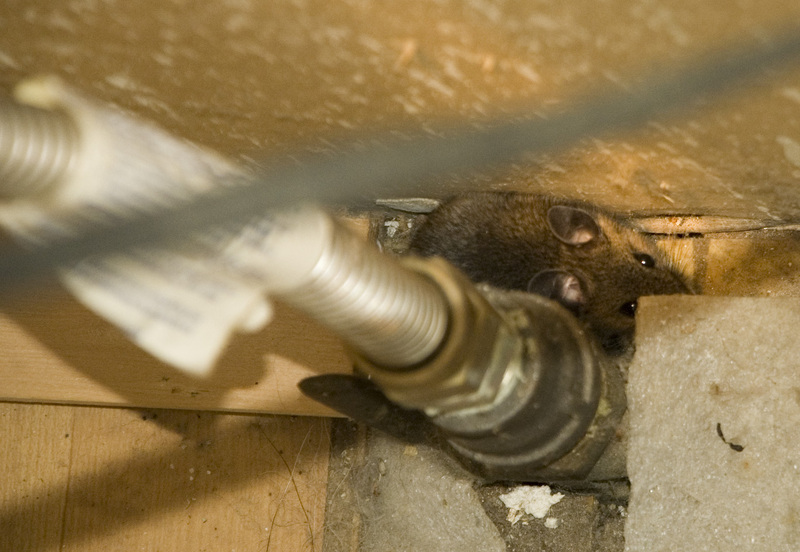 Sure it’s unseemly and inhumane to have to deal with a live mouse stuck to one of those things, but enough is enough. It’s him or me. However, they didn’t have glue traps at the store. At the very least, I decided we (and by we, I mean Rob) should climb behind the oven and fill the space around the gas line with that expanding foam stuff. No more mice will get in and eventually I’ll get a glue trap and the ninja mouse can die a slow, painful death. This was no ordinary mouse. He either really deserved to live, or really deserved to die. We chose life, and set him free in our neighbor’s yard. His right hind leg looks a little funky. I wonder if that’s the one that I pulled the other day. He’s probably not long for the woods anyway, but at least I didn’t kill him.